An audit report of the Ministry of External Affairs has seriously implicated Kshenuka Senewiratne, Additional Secretary, Ministry of External Affairs, former High Commissioner to the UK and former Ambassador/Permanent Representative to the UN in Geneva, according to sources in the ministry who wish to remain anonymous. Accordingly, after she took over as Permanent Representative in November 2009, Senewiratne has contracted Shelva Zug, a company that is reputed to be controlled by some LTTE operatives, to renovate her Official Residence. While the contract was worth more than 150,000 Swiss Francs (more than 20 million Rupees), the report indicates that Senewiratne’s husband had done part of the renovation work and received payment from the mission via Shelva Zug. According to ministry sources, she has thereby grossly violated every Government regulation relating to finance, procurement and administration. There were no quotations, no BOQ, no letter heads, no contract, and moreover a large sum of money had been paid in advance to the company. There has been no justification for awarding the contract to Shelva Zug to carry out construction work from cellar to roof top. Shelva Zug, furthermore, is not a construction company, but a financial and credit institution also dealing with real estate, life insurance, health insurance, housing and car insurances. It is not located in Geneva where there are numerous construction companies, but in Zurich, a city 300 kilometers away from Geneva. An by the Finance Ministry has produced a devastating report after their investigations, but its release has been blocked by Monitoring MP Sajin de Vass Gunawardena, who effectively runs the Foreign Ministry and whose close friendship with Kshenuka Senewiratne is well known. “This is perhaps why Kshenuka is said to have paid such tribute to the role played by Sajin de Vass in Geneva despite his ignorance of the activities of the United Nations and of international humanitarian and human rights law, and despite his being an unknown quantity among the diplomatic corps in Geneva.” our sources further said. This shameless woman “dancing” with Namal has now instigated a ‘letter to Dayan J,accusing him of ‘financial irregularities’ at SLEmbassy in Paris whch the latter has countered well. There apears to be confusion,back-stabbing,bootlicking for power etc. at the External Affairs ministry. GLPeiris appears to be supervised by Sajin Vas Goonewardena. All this bodes ill for the diplomatic service. Kshenuka Senewiratne pot calling the kettle black. I am sorry to ask this? Where on earth we find these village idiots? Everybody is at it, make money out of mother Lanka by hook or crook. Namal looks as if he was born to kolambasanniya film. My gosh, godaya rajawella wage. This woman Kschnuka is a poisonous snake. I really dont know why the wicked woman deliberately destroyed the srilanken diplomacy. The question is why the wicked woman gave the contract to a company run by alleged LTTE suspects. And if this woman and her management caused that much of financial wastage, why the president to keep the very same woman further as the secretary to ministry of external afairs ? why dont they trace the deeds of shelvazug further ? These are the sycophants who pander to corrupt Politicians to enjoy such privilages and benifits. It is a damn disgrace for other decent Professionals to keep company with such supine characters. Looks like the son is taking after the father, like duck to water. I honesty can’t say anything about these allegations without verifying.I hope that the opposition parties will bring up this matter in parliament.Stories appearing on blogs cannot be taken seriously unless verified. 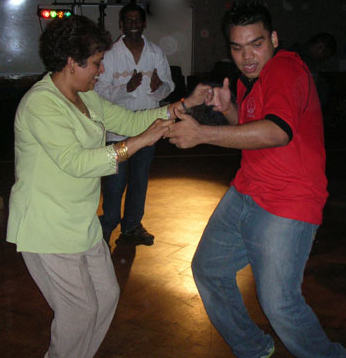 AS for Namal dancing with this lady,Gamini are you jealous?In that case you are more than welcome.But still don’t you think that she is a bit too old and flabby for your liking?But then again someone had said that love is blind! DEEKIRI WALATA BALALUN SAAKKI KIYATHI. Max, your connotation of Lady, is highly superlative. As for me being jealous, see the expression on Namal’s face. ‘Gona karnuwe’? Is it not? Max I honestly pity you! It’s “kujeethayi” isn’t it ? Junta supporters having a gala time. For “nidan namal namba” even though the female is more than 80 if she has get working pulses it is enough!!!!!! This woman and her husband together did a similar scam in London and everyone in UK knew about it. We were glad when she left London but looks like this duos scavenging habits never stops. It is worth to find out how much her husband raked out from our country/government by renting a property for over £12,000 ( Rs 2,100,000) per month as her residence when there are many houses of similar size in the same area is available for £6,000 – £7,00o per months. It is worth to check who has approved such a large expenditure when no funds are available to maintain the interior of our SL high Commission in UK. This is news! Volvin, Colvin’s brother’s daughter doing the Samasamaja stuff! She held stiff pandam to K’gamar’s wife to curry favor with the old man, doing her marketing etc. A good pal of Cabral’s wife’s sister who was in the JM. highly connected on all sides: will never be prosecuted? In fairness to Kshenuka whose reputation was unscathed so far and did a fine job in London etc – let’s await the formal inquiry (conducted properly) into these serious allegations without jumping to conclusions on unconfirmed reports. The aspersions cast towards her husband are very unlikely and bordering on malicious judging from his very limited involvement in his wife’s matters in the past. Phillip, as for my quote, ‘Erudition alone does not maketh a man, but a lot of Common Sense, does’. This person is in the same category as your immediate neighbour of your house which you sold at ‘Gatherum Place’ who is also held high in society as an Erudite. My foot! They are the educated scumm, seeing an opportunity they never waste. These are the Shameless in society who flaunt themselves as VIPs. Phillip, “Kshenuka is one of the best diplomats”..you must be having a laugh. She is one of the weakest diplomats who fails at every single event. She can only read what somebody else writes. She cannot answer any single question about anything, without somebody whispering in her ear. There are many other diplomats, even with their limited English knowledge, can do a far better job than this disgraceful lady. One big problem Sri Lanka had during the past decade was people like she holding onto important diplomatic positions. I remember a meeting with her, where everybody else voiced concern over the lack of activities to counter LTTE propaganda in Britain for which she said ‘but there is nothing we could do, is there?’. What a diplomut!Her rental story is yet another story as Piyal Jayasinghetells us here. The story is, the actual rent that was paid to the landlord was only half what Piyal says here. The other half was shared between brokers who found the house but employed at the High Commission itself. That was her efficiency and leadership. Our embassies need clearing up of dust and garbage like her if we are to benefit from any international relations. What is her background? Please don’t insult the poor who fund these ambassodors and their staff. Her stint at the HC in the UK was riddled with rumours and stories of her sidng with LTTE cadres. Anyone who has sat with her at meetings know her to be very patronisng to the Tamils . She did not show any patritiosm to the country nor did she pursue a national policy.She organised a gp 10 of Tamils and Muslims to visit SL at the expence of the Sri Lankan Taxpayers . They returned to the UK and produced a damning report to say that Jaffna was an open prison . I really do not think she contributed very much to the national cause . Now do you know that her brother Shevan De Silva is same as her sister. Like the sister, her brother Shavan De Silva is a Executive Director at Board of Investments (BOI) and he is famous all talk no results mentality. He is good at manipulating and bad mouthing about people who do real work and if you ask how much real investment he has got through his department, numbers would show his capabilities. I think it is in their genes and I feel sorry for the country to have these type of talkers.. This is simply the corrupt lawless Banana Republic now run as a crazy family business. truth will emerge in time. Kshenuka is a third rate woman who climbed to the top at the Foreign Ministry by bumming the bosses and carrying tales. She will stoop to any low level to achieve what she wants and do not care a hoot about whom she has to stab to get what she wants. She is sweet as honey to the face but will not think twice about slandering them behind their backs. She thinks she is from a very posh background and that all her colleagues at the Ministry are from the slums. Little does she know that every one laughs at her and are disgusted at the way she behaves to bum people in power to get to the top. It’s high time the Government investigates all the fraud and robbing she has done together with her crooked husband and put her behind bars. What a disgrace for Sri Lanka to have a Diplomat like Ksenuka. She has taken every Foreign Minister from Hameed to GL including Kadir gamar (through his wife] for a ride,some of them were not even aware until departure what happened to them. She did some baby sitting for Chandrika in London but pretended not to know her when she arrived at SAARC summit function held under the new president.Her plan to earn billions of rupees through sale of London property narrowly missed due to the commitment of few devoted public officials which is now a fast dwindling band in Srilanka.Perhaps her next aim may be Paris .Dayan has to start packing. I fully agree with all the comments of Gamini. This shamless woman is a garbage to the foreign service and to the External affairs ministry. Her only good qualification is going behind men and was recruited to the ministry with no interview, exams but because she was a former foreign minister Hameed’s woman. Check it out with records and her history.